-- Little or no improvement in the key availability, reliability, and flying-hour metrics over the last several years means too few F-35s will likely be ready for combat when they are most needed, now or for the foreseeable future. -- During durability testing, the Marine and Navy F-35s have suffered so many cracks and received so many repairs and modifications that the test planes can’t complete their 8,000-hour life-expectancy tests. The Marine version’s airframe life could be so short that today’s F-35Bs might end up in the boneyard as early as 2026, 44 years before the program’s planned 2070 sunset. -- Despite years of patches and upgrades, the F-35’s most combat-crucial computer systems continue to malfunction, including the Autonomic Logistics Information System (ALIS) maintenance and parts ordering network; and the data links that display, combine, and exchange target and threat information among fighters and intelligence sources. -- The program has not provided the resources necessary to build, test, and validate the onboard mission-data files that control mission accomplishment and survival. 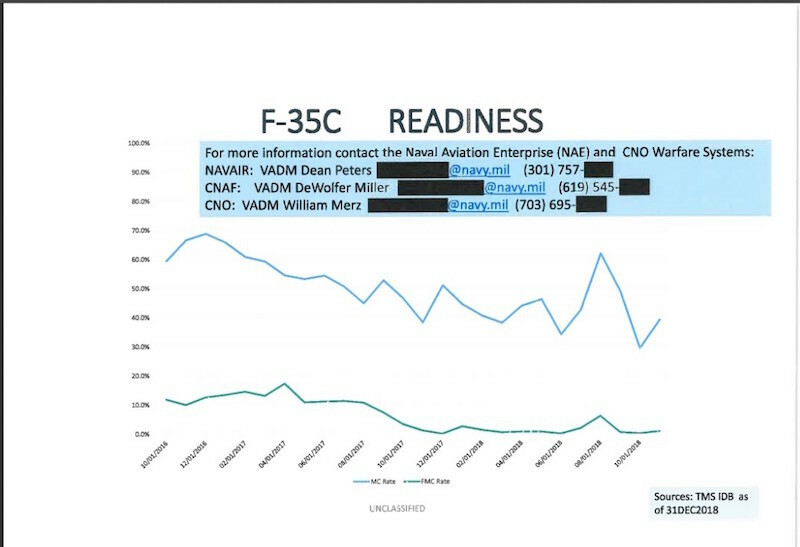 -- As in previous years, cybersecurity testing shows that many previously confirmed F-35 vulnerabilities have not been fixed, meaning that enemy hackers could potentially shut down the ALIS network, steal secret data from the network and onboard computers, and perhaps prevent the F-35 from flying or from accomplishing its missions. -- The all-important and much-delayed F-35 Initial Operational Test and Evaluation report—assessing whether the plane is combat-suitable and ready for full-scale production—may well not only be late (perhaps well into 2020), but may also be based on testing that is considerably less combat-realistic than planned. This is both because test personnel are forced to make do with incompletely developed, deficiency-laden planes, and the F-35 program has for years failed to fund adequate test-range hardware and realistic multi-aircraft, multi-threat simulation facilities. But the report presents precious little hard data on maintainability; availability and flying hours; weapons-testing results; ALIS-caused maintenance problems; pilot difficulties with sensors and display; and shortfalls in testing resources and realism. By leaving out any information on the program’s fully mission capable rates, which previous years’ reports included, DOT&E keeps the public from knowing the percentage of time these aircraft are ready to perform all of their intended missions. It is unclear why this is absent from the report, but it raises questions as to whether performance has actually gotten worse, and whether the Pentagon is seeking to hide that fact. Click here for the full story, on the POGO website. (EDITOR’S NOTE: When the US Navy announced IOC for the F-35C Carrier Variant, we described it as a “publicity stunt” because it was manifestly insincere. 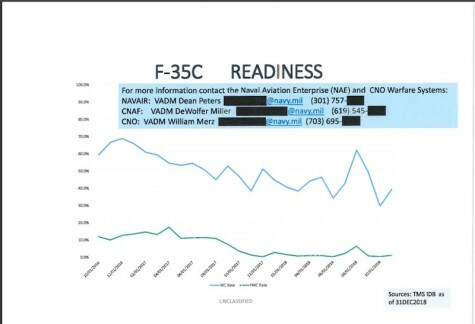 This prompted Commander Ron Flanders, the Public Affairs Officer for the Commander, Naval Air Forces, to complain by e-mail that our “commentary on the F-35C IOC declaration by the Navy was egregious and incorrect,” and to request the comment be withdrawn.